In some other cities throughout the world, I have seen mascots for rail systems, cities, airports, etc. They can be used in marketing materials as well as guides. Has there ever been a push to do this for DART? 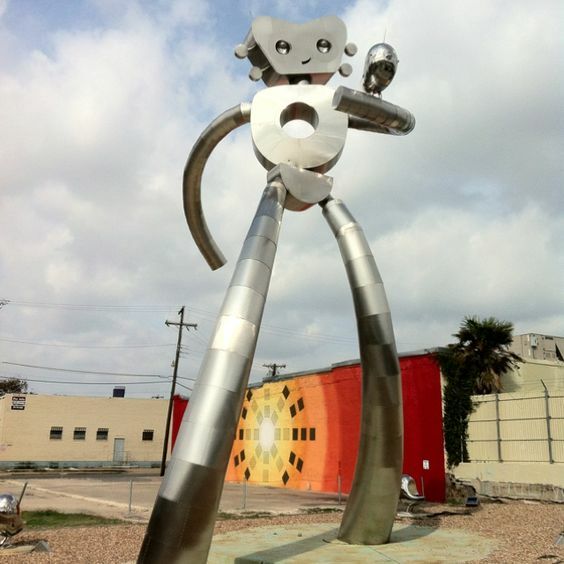 I think the Traveling Man (the robot statue in Deep Ellum) would make a great mascot. He could be drawn into cartoon form and used for marketing purposes, and kind of be like a guide to using DART, places to go, etc. First, they should focus on actually improving the transit system itself so that people will actually ride it due to its usefulness. That's part of what I posted..... the campaign could be used to raise awareness of what is available to transit riders, how to use the system, places to visit in the area of each station, etc. That would increase the perceived usefulness of the system, hopefully increase ridership, which could lead to actual expansions of the system. The mascot could also be used in marketing material and guides targeted to tourists. This will help increase tourism and repeat visits, and make Dallas more tourism friendly. The hostel coming to Deep Ellum should be an interesting example of how good of a tourist experience we can provide. Hostels in Europe develop activity guides, landmark maps, tours, etc. They also help guests navigate public transit. We need to prepare for the way that Millenials like to travel. Mascot should be a slug. It's a solid concept... But DART would find a way to screw it up. [*]First, they'd spend millions on a consulting firm to find out which mascot to go with, even though the simplest approach is right in front of them. [*]Then, they'd over-engineer the mascot to such an extent that spending is out of control, and it's way too big for the purpose it serves. [*]The mascot would then go to all the wrong places, taking a long, meandering course and people would forget it even exists. [*]Once they realize there is a mascot, they'll get upset that they don't see it enough, and threaten to leave DART. [*]DART would then decide that they need multiple mascots to spread across the area, but have no way to afford them due to the massive costs of the first one. [*]The mascot would then spend way too much time trying to serve those who complain, that it has no time to do it's original job. Works pretty well just by name. DART is overflowing with fantastic engineers, yet bereft of fantastic business people. Alex Rodriguez wrote: DART is overflowing with fantastic engineers, yet bereft of fantastic business people. So true. It seems that despite all the potential revenue generation & marketing opportunities available for a public transit system, none have been explored. Maybe with Patrick Kennedy being named to the DART Board, changes will come. As a marketing professional I love the idea, but as a daily customer I'd hate to see them spend resources on anything other than improved service, security and community outreach. That doesn't mean DART can't reach out to a local advertising agency and ask them to do the work pro-bono. It would require Brad Oldham's permission since I believe he owns the rights to Traveling Man. lakewoodhobo wrote: As a marketing professional I love the idea, but as a daily customer I'd hate to see them spend resources on anything other than improved service, security and community outreach. I agree with you on that, it could raise some eyebrows if money is spent on this. But that's a symptom of how user-unfriendly the system currently is. The Traveling Man could be incorporated into an app that makes it easier to find your way to your destination (tied into google maps), find local places to eat and shop (marketing revenue opportunities), and activities and events at each station (also more revenue opportunities). More importantly, making it "fun" could help apprehensive potential riders get over the unfair portrayal of a scary, dirty train system. Screens inside trains could have tips pop up. For example, as you're nearing Mockingbird Station going south, the cute Traveling Man cartoon could pop up on the screen with a text bubble saying "You can transfer here to the Blue Line which will take you to ABC" or "Did you know that you can take the Orange line directly to DFW Airport?" In between, he could pop up and say "Have you tried ABC Restaurant right outside Mockingbird Station? Mention the Traveling Man and get 10% off your order!" (Marketing Revenue opportunity). There's so many possibilities for this that would make the experience so much more user friendly. Mascots should be aimed at entertaining and educating kids, not adults. Therefore I believe the Traveling Man wouldn't be the best choice for a mascot. Wouldn't Big Tex or Pegasus be a better mascot choice? We should revisit this topic in 9 years. By then the revamp of the bus system should be complete and they won't need a mascot. They can just rely on their service, convenience, safety and reliability to get people on board. How sad that a similarly laid out city, Houston, had the foresight to actually focus on getting their riders to where they needed to go by revamping their system, yet DART wants 10 years to do the same. Houston ridership far exceeds ours and there is no reason why that should be so. Totally unacceptable. But there is some consolation I guess in that we currently exceed them at getting our suburban commuters in and out of downtown in rapid fashion. Jbarn wrote: We should revisit this topic in 9 years. By then the revamp of the bus system should be complete and they won't need a mascot. They can just rely on their service, convenience, safety and reliability to get people on board. How sad that a similarly laid out city, Houston, had the foresight to actually focus on getting their riders to where they needed to go by revamping their system, yet DART wants 10 years to do the same. Houston ridership far exceeds ours and there is no reason why that should be so. Totally unacceptable. But there is some consolation I guess in that we currently exceed them at getting our suburban commuters in and out of downtown in rapid fashion. January - June 2016 = 42,458,540, or 234,577 riders per day (over 181 days). All 2015 = 92,500,000, or 253,424 riders per day (over 365 days). It appears to me that DART averages almost 10,000 more riders per day than Metro. Going by those numbers, it's a difference of almost 20,000 riders per day. I believe we should subtract the 22 million passengers that DART includes in their numbers that are HOV lane drivers. I am pretty sure Metro is not including those folks in their numbers. According to the APTA - DARTS daily ridership is 231k, houstons is 306k. HAHAHAHA yes this is what I was picturing, just in cartoon form and not so snarky.